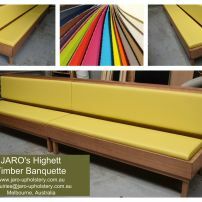 commented on "JARO's Highett Timber Banquette, Made in Melbourne Australia"
Our new Highett Timber Banquette is available in many colour choices and textures including commercial grade fabrics, vinyl and leather. We can custom make to the exact size and timber colour you require. Click on picture for further information.